With an upcoming role in the new movie “The Shallows,” Blake had to whip herself into shape fast! The actress, now 28, says that she felt the pressure of losing the baby weight after the birth of her daughter in December, 2014, “There’s pressure to lose it…I think it’s silly,” she told the BBC in May, adding that she wasn’t “obsessing” about regaining her pre-baby physique at that time (source).” Beauty doesn’t come easy and a fantastic body comes with hard work and a diligent schedule. So, how did Blake get the weight off, keep it off, and keep her energy levels high for all of her on screen appearances? A trainer of course! Don Saladino, says that her fitness wasn’t just about looking great in a bikini. He was training her for energy and endurance as well. The exercise routine went from training one to two days a week, to five to six days a week. However, if you think Lively is in the gym for 3, 4, 5 hours a day you would be completely wrong. Her workouts last roughly an hour. She’s in and out! “I told her to listen to her body,” Saladino says. “When you feel great, get on it. When you don’t feel great, shift down a gear. And when you feel like complete crap do really minimal work,” like 10 minutes on the elliptical. Abs are made in the kitchen and diet is always key to a great physique. If you are looking to slim down like Blake, mimic her eating habits. She consumes 4 small meals. Eat meals that are well balanced and contain “slow burning” carbs. She makes sure to eat protein, and vegetables as part of each meal as well. One of the other key factors to Blake’s bikini body is eating a mostly gluten free diet with the addition of coconut oil to keep her full through out the day. 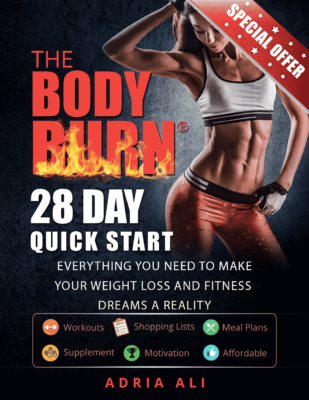 Fitness Tips: I’ve already done all the work for you in our new program, Body Burn! It uses slow burning carbs, gluten free – balanced meals, coconut oils (MCT), and complete exercise routines 5 – 6 days a week! Blake Lively’s workout is just part of her success. The combination of her balanced meal plan with healthy fats, her consistent routine, and her guidance from her trainer, she’s been able to get bikini ready in record time!